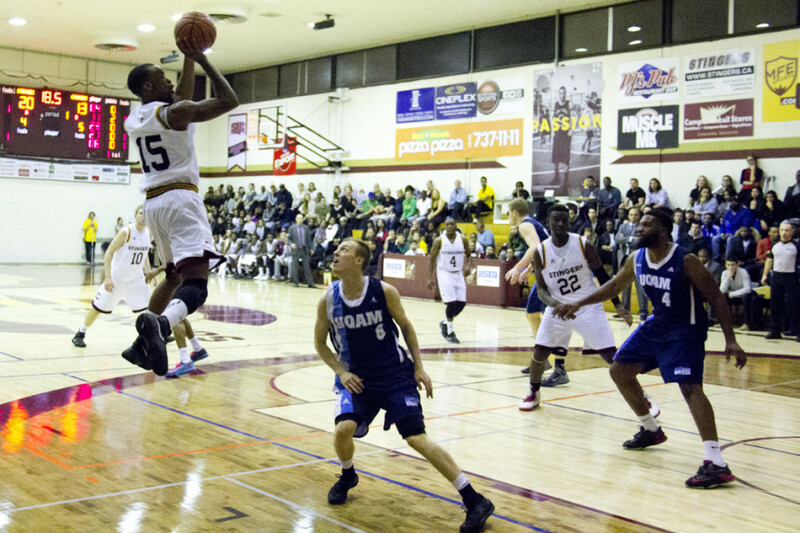 The Concordia University men’s basketball team defeated the Laval Rouge-et-Or 67-60 at home on Thursday night to extend their winning streak to seven games. Ken Beaulieu led all scorers with 29 points. After starting off the season with a 2-4 record, the Stingers have hit full gear and show no signs of slowing down. Their seven straight victories have sling shot them into first place in the Reseau de Sport Etudiant Quebec with a showdown against second place McGill looming on Saturday. Concordia held the lead from the start as Beaulieu began the night with a three-pointer and a pair of a dunks early on, a foreshadowing of the Longueil, QC native’s night. The Stingers jumped out to a 15-9 lead after the first quarter. Beaulieu’s 17 first half points would see the teams enter the locker rooms at halftime with a 31-23 score line in favour of Concordia. Momentum swung back and forth in the third quarter as Laval tried to claw their way out of the deficit. Alexandre Leclerc, the RSEQ’s leading scorer, was essentially carrying the Rouge-et-Or on his shoulders. The 6’6 Saguenay, QC native finished with 20 points and nine rebounds. However, as time wound down in the third quarter, Concordia answered all of Leclerc’s points and entered the final frame with a twelve-point lead. The final quarter was a tense one. Laval finally began to chip away and cut down on the lead. Leclerc made two incredible 3-point shots to make it a three point game with 14 seconds left. After calling a timeout, the Stingers would have to successfully inbound the ball and avoid a turnover at all costs. Beaulieu was the one to play it inbounds and with only five seconds to do so. Tight coverage by the Laval defenders made a pass to a teammate impossible, so Beaulieu bounced it off the back of an opposing player and retrieved it himself. The witty play made the Rouge-et-Or have to foul him and sent him to the free throw line to ice the game and make it a two-score contest. He made both and on the ensuing play, stole the ball and dunked it at the buzzer. Michael Fosu and Schneiders Suffrard both finished with 10 points as well. The Stingers take on the McGill Redmen on Saturday with first place on the line. Concordia currently sits two points ahead of McGill in the standings, but the Redmen have one game in hand. The game is at 4 p.m. at the Concordia gymnasium.